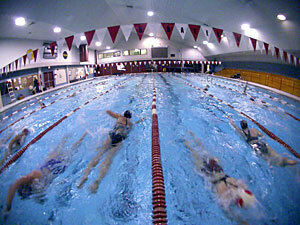 Built in 1980, the Tarbell Pool is home to Bates’ men’s and women’s swimming and diving teams, as well as club water polo. Tarbell features eight lanes and an underwater window, and can be configured into 25-meter or 25-yard lane lengths. The pool is named after Caroline E. Tarbell, Bates Class of 1919.